If you’re in England like us, you’ll no doubt be looking forward to the bank holiday this weekend! But even if you’re from further climes, school is still out for another week or two. Now, how to get the kids ready for back-to-school season? It’s normal to warm up before physical exercise, but did you know that regular warm-up brain exercises will help boost logic, memory and more? We definitely had this in mind while we were creating Galactic Genius with Astro Cat last year. 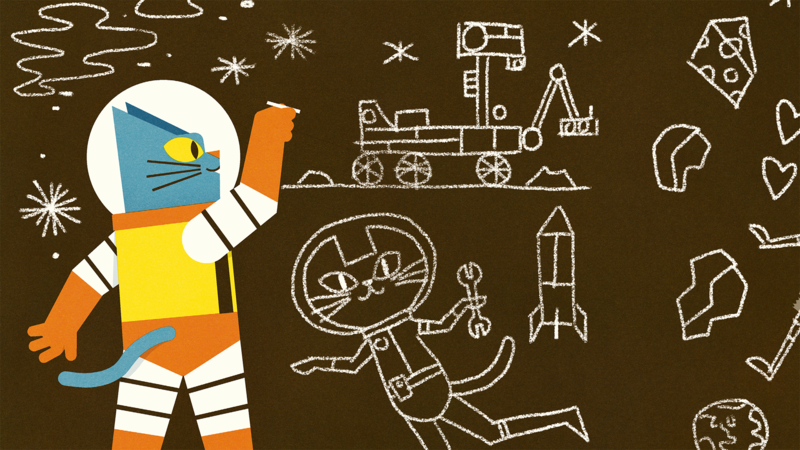 We wanted to let the funny feline scientist and friends loose in alien worlds filled with puzzles and challenges. You can get started for free and play Daily Dashes each morning in the run up to school. The six mini-games will put kids’ memory, logic, concentration and reaction times to the test (plus there are bonus space facts to discover as you earn stickers!). What’s a makerspace, we hear you ask? It’s one of the latest STEAM buzzwords floating around educational blogs, and you can find a great introduction here. In short, you want to create a space for interdisciplinary learning: using multiple skills that unite, say, art and science. For example, you could build and code a robot or game. Or, you could make paper-maché planets and use them to learn about the solar system (it’s easy: just blow up some balloons to a variety of sizes to help you get the shape right). If you know anything about England, you’ll know that once summer is over it’s pretty much rain all the time. While the great outdoors is still- you know- really GREAT, make sure to get out there! Now is the perfect time to visit a zoo (and learn to draw the animals you see in Artie’s World), or go on a nature trail through local woods. You can get just as much learning done outside as in the classroom, so make sure to get a balance before the days start getting shorter. Do you have any other plans, edtech or otherwise, for the bank holiday? Whatever you and the little ones get up to, the Minilab team wishes you a happy day off and a smooth back-to-school season!